An exciting alternative to a conventional conservatory is an orangery. Orangeries are becoming evermore popular with homeowners and it is not hard to see why. An orangery is the perfect combination of a conservatory and an extension. You will benefit from the extra sunlight, beautiful exterior and energy efficiency of a conservatory with the added living space and value of an extension. What’s more, an orangery is an affordable and practical solution for your home. 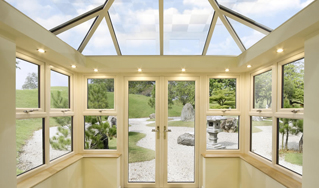 >Why Choose Our Orangeries? Here at FineGlaze we install two fantastic orangery systems: the Ultraframe Loggia and the Synseal Global Summer. Please see below for a brief outline of the benefits of these two wonderful orangery options. Loggia orangeries will give you the look and strength of a traditional orangery without the hefty price-tag. The extra living space it provides is similar to that of a brick-built extension. However, as it is technically classed as a conservatory there is usually no need for planning permission, making the installation an easier and less onerous process. If you have a structure in place already, it is even possible to convert your existing conservatory into a Loggia orangery. Loggia orangeries provide outstanding energy efficiency. The corner post and pillar U value is 0.15 which is 100% more than current building regulations require. This means it can potentially help lower your heating bills whilst providing you with a comfortable and enjoyable living space all year-round. The Loggia’s construction is such, that most of the weight of the roof is carried by the columns so the options of size and design are practically limitless. Available in various colours including, classic white, pure cream, urban grey and landmark green you can really tailor your conservatory to your own personal taste. There is also plenty of choice when it comes to glazing options. You can have your Loggia orangery installed with sash windows for a traditional look or bi-folding doors to create more space. There is the option to have fully glazed walls to gain panoramic views and gain extra sunlight, or you can have dwarf walls for a more traditional orangery appearance. The choice really is yours! With the Global Summer Orangery system you won’t ever have to worry about leaking, or costly parapet walls. Manufactured using high quality materials, the Global Summer Orangery is exceptionally strong. It’s secure structure is made to stand the test of time. Combining new technology with traditional aesthetics, the Global Summer is exceptionally crafted. Available in both the Georgian and Victorian style, these orangeries feature delicate finials and crestings. Visually stunning, you will be able to enjoy their timeless aesthetics for many years to come. We have a range of colours to complement your existing build. Our varied collection provides you with quality, lasting finishes. Choose from standard colours such as white and brown or if you prefer a more traditional style then we have a number of beautiful woodgrain finishes. 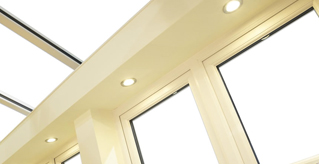 For further information regarding our Orangeries, please contact us on: 01296 435652. Our friendly team of advisers will be happy to help with your enquiry. We provide bespoke orangeries in Aylesbury, Dunstable, Tring, Leighton Buzzard, Milton Keynes, Oxford and throughout Buckingham and the surrounding areas.